If you are planning to trek in Iran’s cold and dry mountains, there are few things that you should bear in mind before embarking on this adventure. Trekking can be extremely unpleasant when we are not prepared enough, especially in harsh weather conditions. In this article, we will share some simple tips that can make your trekking a lot easier and more enjoyable. What to Wear While Trekking? First of all, you must choose suitable and comfortable clothes. A bad choice can turn the ideal trek into a nightmare. There is a Swedish quote that says “there is not bad weather, only bad clothes”. Choosing the right clothing that adapts to the weather conditions is vital. For our trek, we have to find a balance between our clothing keeping us warm enough to feel comfortable but causing us to sweat as little as possible. Our bodies will lose temperature much quicker with wet clothes. If you are not too sure what clothing to choose, you can take with you many thin layers of clothing rather than only a few good thick layers. In this way, you can put on and take off the clothes and easily find a balance that maintains your body at the right temperature. There are three main types of layers: the skin contact layer, the insulating layer and the outer cover. The skin contact layer should be breathable to avoid sweating and getting cold. The insulating layer will help us to keep a warm airy layer around our body. Lastly, the outer cover we use to protect ourselves from wind, rain and sun. We can use more than one layer for each layer type so that we can adapt to the weather condition easily. We will put on and take off clothes depending on the weather and temperature conditions. We should stop every 15-20 minutes to take a small sip of water. Every one hour to one hour and a half, we should take a break to have a snap and recover our energy. As discussed before, when we are doing exercise, we need to constantly refuel. So, you can eat a snack in each pause. With regular and constant breaks, we will be able to walk for longer periods of time. 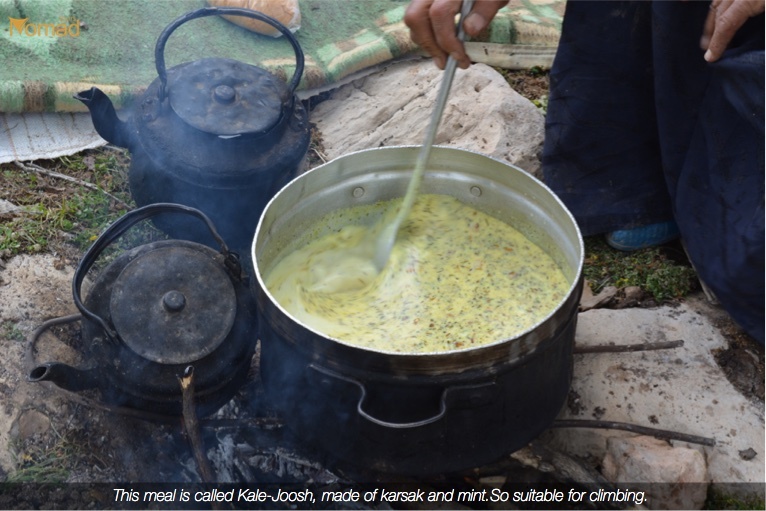 What Can You Eat When You Trek? Eat and drink regularly. Hydrating correctly is a critical aspect of trekking. We shouldn’t forget this, regardless of the weather conditions. In cold weather conditions, we may have the impression of not being dehydrated. In fact, even in cold conditions, you are constantly perspiring even though you do not physically see the sweat dripping off your forehead. Even while breathing, we are constantly losing water. Two-thirds of our bodies are made of water and it’s vital to keep our body functioning properly. Dehydration can provoke fatigue, disorientation, headache and a decrease in attention span. Likewise, eating correctly is as important as staying hydrated. Our body runs out of energy reserves if we do not eat anything after two hours of exercising. Snacks like nuts, seeds, nut-based bars, nut butter packs, dried or freeze-dried fruits and veggies, energy bars, gels, granola or granola bars, can be pretty useful solutions to eat between meals and keep the body charged when we are in the mountains. Be careful not to eat heavily during the trek. For example, nomads in their migration eat a lot of simple light foods, such as milk and bread or yogurt and bread. Digesting these foods is much easier for the body compared to fatty foods such as meat with rice. So instead of having a very greasy and heavy meal, keep going with the lighter options. When we get cold, we start losing temperature through our extremities (head, hands, feet, fingers and toes). This is a defense mechanism. When there is a danger of freezing, the blood flows only to the center and most vital parts of the bodies at the expenses of the most “dispensable” parts of the body. Furthermore, the extremities are the points through which we lose the heat of the whole body. So what to do?! A small change such as wearing a winter hat can keep you warmer in the night than a thick jumper, so you shouldn’t leave it at home. In the same way, it would be useful as well to have always some gloves just in case of very cold temperatures. Finally, a good and warm sock will be essential to keep our feet warm. So take your time and make a good sock choice. On the mountain, we are more exposed to ultraviolet radiation and even if the weather is cold, we are more likely to be sunburned. Therefore, never forget to put on sunscreen and make sure you choose the appropriate SPF according to your skin type and the weather. In this way, you will avoid getting sunburned and decrease your risk of premature aging and skin cancer. Last but not least, we advise testing all the material, clothes and foods at home before going on a trek with them. Each one of us is unique and you will never know if something works well for you until you try it yourself. Therefore, never experiment with new products while trekking in the mountain and try at home before using it to avoid a potential disaster.